I am fascinated by the way lions hunt. I’ve read that it’s the lionesses that actually do the “lion’s share” of the work. The males are obviously incredibly intimidating, with their manes and their ferocious roars, but it’s the chicks you really have to watch out for. The fact that lionesses do not have a big, recognizable mane actually helps them sneak up on whatever they are hunting. They lie in wait, hidden in the tall grass, motionless like statues. I listened to a sermon by Pastor Brian Houston in which he said that the males do play an important, albeit small, role. While the females stalk their prey from behind, the king of the jungle will come from the front and let loose one of those roars that gives him his spot at the top of the food chain. This sound is so powerful it can be heard for up to five miles away. Hearing that terrifying noise causes the gazelle or antelope to run as far as they can away from whatever made that sound. What they don’t know is that as scary as it sounded, the one who did the roaring is more bark than bite. So away they go — directly into the path of the real threat: the waiting lioness. In other words, the prey’s instincts are wrong. Going with their guts causes them to make the last mistake of their short, little lives. It’s counterintuitive, but the right choice would be to override their emotions and run toward the roar. It’s shocking how often that is true. When you run from things that scare you, you move toward danger, not away from it. If you fail to face your fears, they will always be right there behind you. You must suppress the little voice inside that’s telling you to get out of Dodge. It is not your friend. When you feel that panicky fight-or-flight sensation and you want to run away, do the opposite. Run toward the roar. You have come into the kingdom for just such a time as this (Esther 4:14). Jennie and I made this decision as we chose how we were going to respond to the terrible nightmare of having our daughter taken from us. Everyone grieves differently. It’s a process, not a science. But we decided that we would go through it running toward the roar. Here is an excerpt from my journal, where I described our approach. We grieved staring this thing in the face. When unpacking the bag [Lenya] had brought to her grandma’s containing the clothes she had worn that Thursday, before changing into her pj’s that she died in, it was extremely tempting to hide from it or cling to it. Either keeping them as keepsakes, making all her clothing sacred, or not opening it at all, refusing to go there. But we chose to hug them and weep over them, smelling her on them, and then we washed them so they would be folded and in the drawer for Daisy and then Clover to wear one day. Nothing would be sacred. We didn’t want boxes full of mementos waiting to blow us up when we stepped on them in ten years. Looking at pictures, watching movies, going through her clothes — we made the choice to bring this thing to our breast and let it sink its teeth into us and empty its venom. For some reason, though it terrified me, I had to stare this in the eyes and, with my knees shaking, say, “Do your worst.” Maybe it will kill us, but if we can get through it we won’t have to live in fear. I didn’t want anything sneaking up on me. I would go all the way into the depths of this sorrow and drink it down to the dregs. I stayed up til 3:00 a.m. or later each night for four or five days, watching videos, pulling out photos, and reliving her five years on this earth, to find all the best clips and pictures to play at her celebration so the world would know who she was. It was horrendously traumatic and would have been easier to take a Xanax and stay in bed crying… but I knew it would only delay the inevitable. No shrines, no booby traps… we faced it all, and then pushed on into the future. One of the most difficult days was when the hospital gave us a box with the things Lenya had been wearing in the emergency room. I didn’t want to open it. We felt like running in the opposite direction. But eventually Jennie and I braced ourselves and faced it. The box contained her little socks, leggings, and the top that had been cut off her with medical scissors. All the emergency room personnel had written on a card they included in the package. At the bottom was an ink handprint and footprint an ER nurse had thoughtfully captured from Lenya’s hands and feet as a keepsake. Jennie and I wept on the floor as we pulled these items out, one by one. It felt as if fire were burning underneath my skin, and my brain grew hot. The socks, more than anything, destroyed me. It was more than I could bear. We cried together and called on the Lord and prayed for the people who worked in the ER. And then we got up. I pray you never have to have your heart pierced with a sword like that, but like it or not, in ways small and large, we are all going to have to confront our fears or abandon our destinies. The only path to the haul of fish you are meant to catch and the lives you are meant to reach is to launch out into the deep and sail through things that are scary. Smooth seas never made a skilled sailor. God calls us to go to places that frighten us so that we will fully trust Him. The only way for you to see God do the kinds of things He desires to do in and through you is to run toward the roar again and again and again. It’s incredible that David was willing to fight Goliath at all. The fact that he sprinted toward what seemed like certain death is astounding. He killed the giant in the end, but first he had to run toward the very thing that terrified him the most. What in your life are you being called to right now? Perhaps it’s a song you are meant to write or a church you are meant to plant. Maybe it’s pulling your children out of school to educate them at home or allowing your son to go to a public school so he can share his faith and be salt and light. Are you vacillating between the safety of a job you hate and the terrifying prospect of starting your own business? Maybe you are supposed to go back to school, or on the other hand, it might be that you should opt out of college in order to pursue a different kind of education. I can’t tell you what God’s will for your life is. There is no magic map. All I can tell you is that you must not let fear play a part in your decision making. You can’t ignore fear, but you don’t have to let it control you. I guarantee you David’s pulse thundered like a war drum in his chest, and everything in him urged him to retreat, but he still hustled toward the giant. True bravery isn’t feeling no fear — it’s being afraid and moving forward anyway. I know this for sure: Turning your back on the roar will feel good in the moment. You will feel a euphoric giddiness once you have put some distance between yourself and the lunacy you were considering. Cooler heads prevailed, you will think as you wipe the dust off your hands and prepare to return to business as usual. Yes, running toward the roar can be excruciating, and there are no guarantees. It’s also possible to misjudge the direction of the roar you are trying to run toward. It could be a dead end. When you live a life of faith, there are going to be questions that have no answers, because for there to be faith, there has to be mystery. That’s just life in the deep end. It would be nice if we could have the safety of the shore and the potential of the open ocean at the same time, but that’s not how it works. Nothing ventured, nothing gained. If you want to catch fish you have to launch out where the fish live. “Are You Ready for War,” Braveheart , directed by Mel Gibson (1995; Hollywood: Paramount Home Video, 2002), DVD. 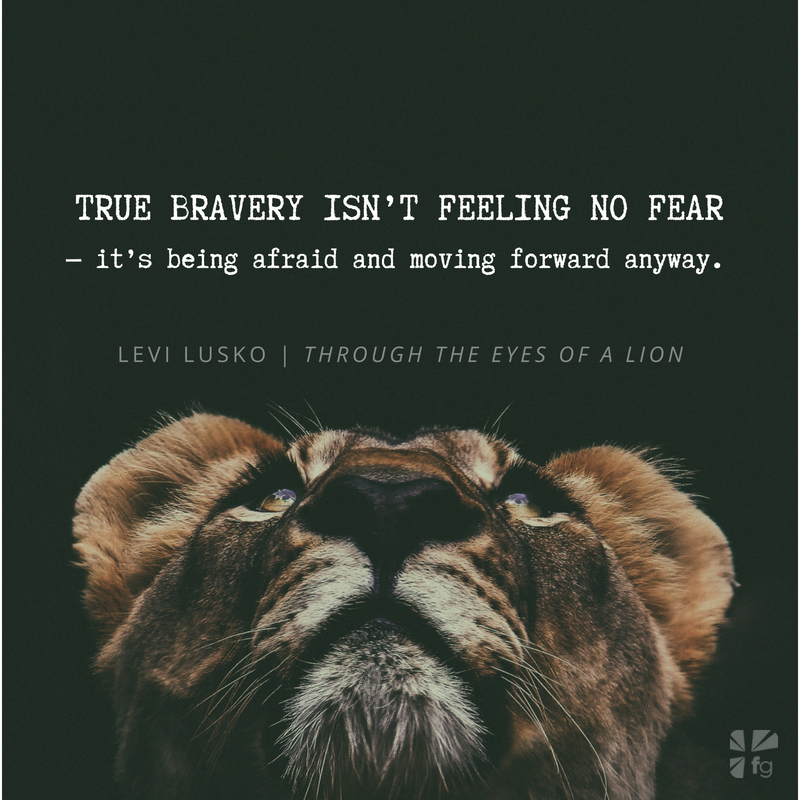 Excerpted with permission from Through the Eyes of a Lion by Levi Lusko, copyright Levi Lusko. What fear are you avoiding today? What are you running from? What muscles of faith do you need to build? Come share with us on our blog! We want to hear from you!